As you can see I have started to dig another mudpond, this pond will be bigger than some of the others, so I decided to hire a bigger digger to dig this one. The topsoil has been removed and we can now start marking out the mudpond. The pond has now been marked out, so we can now start digging the mudpond. As you can see we have started digging out the mudpond, the bigger machine makes it a lot quicker and easier, so this one will not take very long to dig. The pond is nearly finished, just need to finish digging out the last side. As you can see the pond in now finished, just need to finish off the banks, then we can start filling it up. The pond is now all finished and I have started to fill it up. The pond is now full and looking good and is my little bit of Japan. The koi in the outside mudpond have flocked spawned a couple of times and I thought there was little chance of any of the fry serving, but I managed to spot these four swimming around the pond. So it seems when I next net the pond I might get more koi out than I started with. One of my dogs keeping a eye on the koi in the new mudpond. 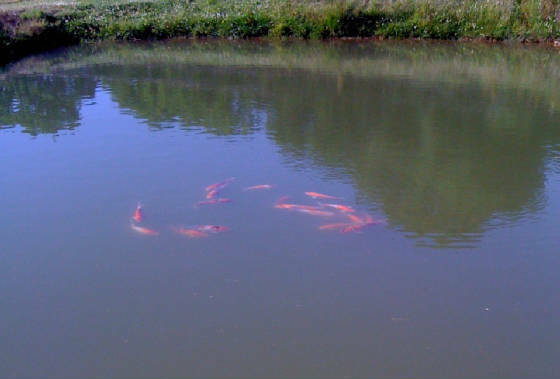 A few koi enjoying the last few days of summer before the autumn harvest.